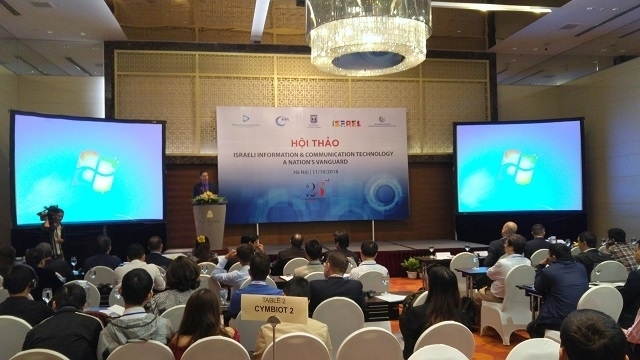 With a huge young market and an increased number of mobile subscribers and internet users, Vietnam offers endless cooperation opportunities for partners in ICT, including Israel, a strong tech nation, heard an international workshop in Hanoi, on October 11. The event, as part of the activities to celebrate the 25th anniversary of Vietnam-Israel diplomatic ties (1993-2018), was jointly held by the Vietnam Internet Association (VIA), the Israeli Embassy in Vietnam, the Foreign Trade Administration at the Israeli Ministry of Economy and Industry and the Israel Export and International Cooperation Institute. Speaking at the workshop, VIA Vice President, Vu The Binh, said that Vietnam has approximately 124 million mobile subscribers among a population of 93 million people, including 50 million 3G and 14 million 4G subscribers. In addition, 54.2% of the population uses the Internet. In the next five years, the development of a fiber optic cable system, 4G, and especially 5G network, would contribute greatly to promoting Vietnam’s economic development in general and the ITC industry in particular, Binh stated. Moreover, the open policy towards foreign investment in the field of ICT would act as a solid foundation for domestic and foreign businesses’ development. However, there is still difficulty as a large number of internet users has resulted in fierce competition and market saturation, requiring telecom, internet and ICT businesses to continually innovate to improve their product and service quality. Cooperating with foreign businesses, including Israel - a tech giant - is a solution for Vietnamese businesses, Binh suggested. Yaniv Tessel, Counsellor at the Economic and Trade Mission under the Israeli Embassy in Vietnam, said that the top 12 Israel ICT companies present at the workshop shared their experience and introduced solutions to open up opportunities for cooperation and technology transfer in the field between the two countries. Praising Vietnam’s potential for ICT development, Krael Amitai, Manager at Mobile Sector under Hi-Tech Department of the Israel Export and International Cooperation Institute, said that Vietnam is a huge country in term of market development for ICT, as for example, MobiFone, one of Vietnam’s giant tech companies, has 15 million mobile subscribers alone. That offers huge potential for bilateral cooperation in ICT, Amitai said, adding that Israel has different kind of solutions regarding ICT and smart cities, particularly in terms of the internet of things (IoT), Big Data, artificial intelligence, command and control, and data transfer that could be offered to support Vietnam via technology transfers. At the workshop, delegates explore an overview of ICT development which is Israel's strength and surveyed Israeli top solutions in the field, including networks and infrastructure, value added service, intelligent city and building management, video transport optimisation, video management and monitoring, Big Data management, IoT, mobile services and mobile network security. Businesses from both sides also exchanged to seek cooperation opportunities at the event.